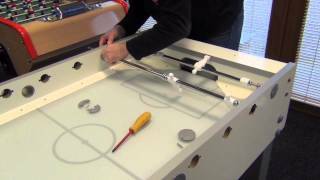 In this video we show you how to install a Sulpie foosball table - this model is the Evolution, in high gloss white paint with silver trim and custom teams. The great thing about Sulpie tables is you can pick your team colours free of charge - we have chosen England vs Brazil. 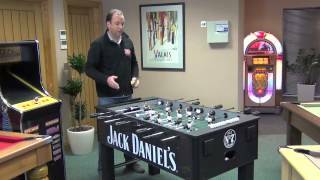 As we mention in the video, the Bonzini tables are very similar, so if you are looking to install one of these yourself you can also use this video as a guide. The table is pre-constructed, so it's just a matter of unpacking it and fitting the legs, which is pretty straightforward. If you need any more info or advice please just give our friendly customer service team a call on 0800 622 6464 or 01454 413636.